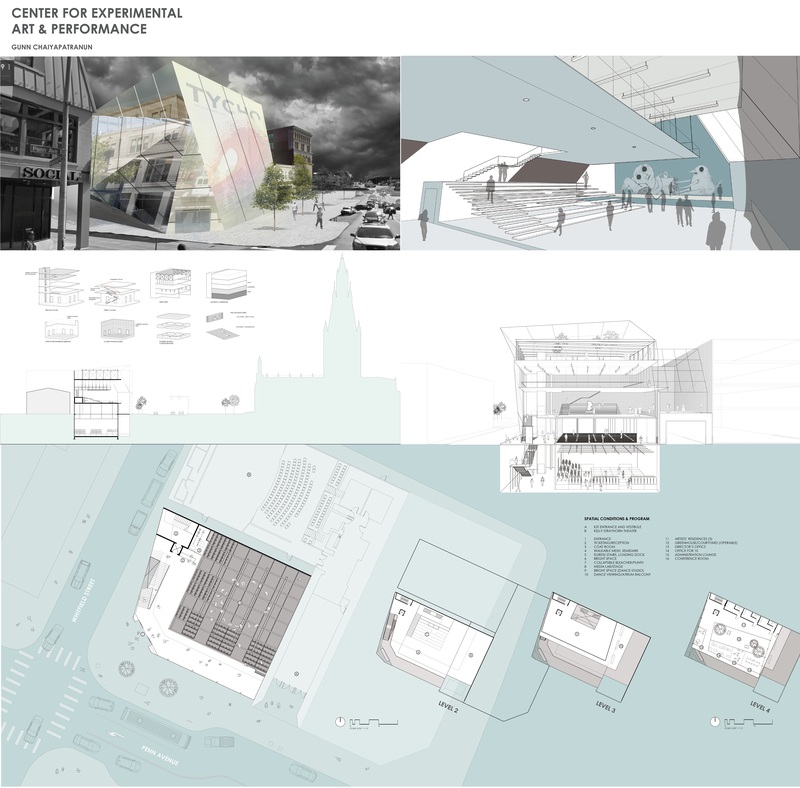 This proposal for the experimental performances and art center is one that embodies the qualities of new media art in its language of construction and poetry of design. New media art is an abstract concept that is constantly being re-defined by definition due to its relative adjective “new”. As technology advances, the boundaries for this area of exploration expand and morph into new understandings of what this art type really means. Correspondingly, the proposed building is one that allows for flexibility in the form of customizable seating arrangements, room sizes, ceiling heights, brightness, and types of lighting, allowing the building to become a blank slate ready to accommodate any new media art in whatever form it may come in. Another way that new media has been defined is an art form that emphasizes the ephemeral process of creating art and the excitement and adrenaline that comes with viewing live art or interactive performances that cannot be reproduced impeccably, rather than glorifying the final product of an art piece as something timeless like we always have before. As an interpretation of this, the building is designed so that its users can easily understand and read the logic behind the building structure. The fourth floor is a vierendeel structure from which the third is hung, the basement is a foundation on which the first rests and the piano nobile (second level) is completely open and is effectively just the roof of the first level. This is done without distracting visitors from appreciating new media by being washed with white paint. By doing so, the building acts \as a display shelf on which new media creations take the limelight.